No carmaker was immune to the Seventies. Everyone was looking toward the future, to pop-up headlights and skyscraper-swinging doors and long, low front ends that could shear off an ankle or two. Spaceships of our brave new world! The Italians led the way, with Bertone, Pininfarina, and Italdesign—but Mercedes-Benz presented the C111, Mazda the RX500, and GM the Aerovette. And despite all the tradition, despite all the upper-crust British stuffiness and the prep-school toffs with Holland & Holland side-by-side shotguns who gravitate toward the brand, not even Aston Martin was safe from the wonderful world of wedges. The Aston Martin Bulldog, Project K9.01—get it?—was supposed to be the fastest production car in the world. What’s the point of introducing a wedge if it’s not the fastest wedge? The Bulldog used the company’s largest engine, the 5.3-liter V8; in the “Oscar India” V8 Vantage, the fastest production car Great Britain had yet produced, this engine had 473 horsepower. In the Bulldog, mounted in the middle and sporting a pair of Garrett turbochargers, it made over 700 horsepower. In late 1979, Aston Martin drivers tested the car at the MIRA proving grounds and reached 191 miles per hour. Engineers, still not satisfied, boasted that it could hit 237 mph. Why not brag about theoretics? The Bulldog already looked like it could. Just 43 inches high, with the shape of a pencil eraser and a whiff of unfinished roughness, the Bulldog was as long as a Seventies Cadillac and resembled a pissed-off Lotus Esprit. Its coefficient of drag was a scant 0.34. When the gull-wing doors swung up, they took a piece of the car’s floor with them and doubled the car’s height. (Curiously, the roof panel remained in place, making ingress and egress a contortionist’s adventure filled with concussion-inducing potential!) The front nose panel lowered down to expose a whole row of lights, as square and angular as the rest of the car. Roger Moore should’ve driven it in Moonraker. Even the unadorned front panel suggested a hint of the classic Aston Martin grille. The interior was the wave of the future: LEDs and touchscreens! 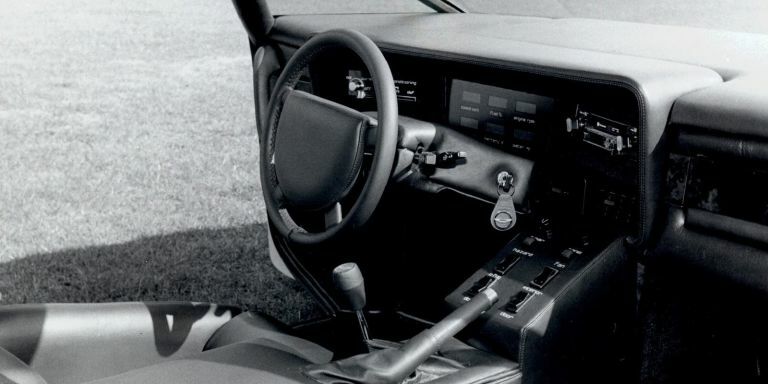 You think Cadillac’s CUE or BMW’s iDrive might be wonky today—imagine stabbing your finger toward that leather dashboard until you froth at the mouth. Those who bought an Aston Martin Lagonda, and regretted it immediately, didn’t have to imagine. 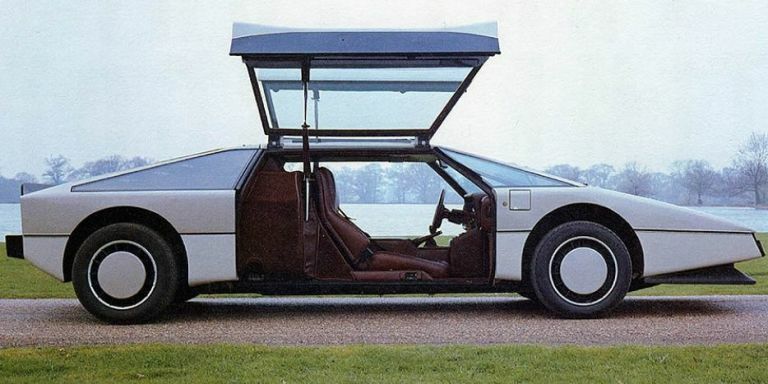 The Bulldog shared the Lagonda’s insane styling, its interior systems, and its overreaching failures: Aston Martin wanted to build 25 Bulldogs, but the company ran out of money, again, and only finished the one. Four years after its debut the company sold the concept for £130,000, or approximately $173,000 in 1980s money. It is probably worth a few million today. Hey, nobody said the future would come cheap.